Today was the Barbican Library, which was a drastic change from St. Paul's. The Barbican is a public library built in the 1980s in an area rebuilt after being bombed in WWII. 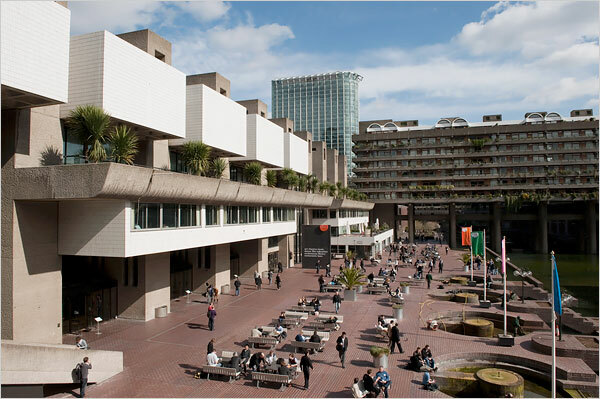 Around 9,000 people actually live there, but over 300,000 work or go in and out of the Barbican Center. The library itself was not terribly different from our own public libraries, though they do have an arts library (which focuses on architecture and perfoming arts) as well as a music library. The area containing the library was not designed for this purpose, which presents interesting challenges in terms of shelving and layout. The librarian also explained that the thick concrete walls in the building make it difficult to access the wi-fi network. One thing I found particularly interesting was the Bookstart Program that the children's librarian explained to us. Bookstart is a national program that entitles every child three free packs of books, that are given to them at intervals beginning when they are toddlers up until age five. The program even receives some government funding. After eating lunch at the Barbican Center, a classmate and I went to the Tate Modern. Wow. Sometimes I forget how much I love art. It was fantastic. I saw many famous pieces, including Lichtenstein's Whaam!, which I enjoyed immensely. Really, the whole museum was terrific. I'm always surprised by how much I still remember about art, sicne I haven't studied it in so long. The abstract expressionist gallery was probably my favorite. After dinner, my class got tickets to see a play called Nevermore, which was a musical about Edgar Allan Poe. Given that I absolutely love Poe, it was right up my alley. The set was minimal, but the costumes and the props were outstanding--very Tim Burton-esque. The music used lines from Poe's poetry, and several of his short stories were alluded to throughout the play.